The kitchen job went bust.. long story short the people who we paid to insure proper measurements measured wrong. This caused a 6″ gap in the counter which basically shut down forward progress on installing a kitchen. Of course the old counter had been removed prior to learning this therefore finagling was involved. In the end our excellent contractor Vicki got us the ok to destroy the wrong counter and she dropped out sink back into it. Plumbed and ready we have a floating counter with nothing sealed or fully mounted waiting till Sept. 2nd when the new one gets dropped off. I’m glad it’s been resolved but some of this turned into finger pointing. Home Depot pointed a finger at Vicky questioning her ability to do her job, as if anyone else could make a magical 6 inches of counter grow, or the people who should have measured right pointing at air as if they had anyone who was more responsible. Please.. if you screw up, just accept it.. Accept it, tell me about it, and lets move forward. Don’t be a child. Let’s put our energies to better use, else you lose face with me, and that is something hard to get back. 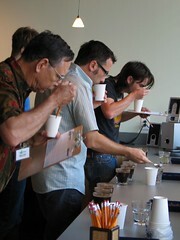 On the up, and I mean happy day, Friday was a [Counter Culture Coffee](http://www.counterculturecoffee.com) cupping. We had a few local [Coffee Geeks](http://www.coffeegeek.com) step out as well as a shop owner, some [Octane Coffee](http://www.octanecoffee.com) folks, and Robin’s parents made it too. As always we had a great time. Karen & Bill had never cupped before so this gave them an opportunity to once again fine tune their tastebuds and seek what had been sitting their all along. Fun stuff. We also spent some time chatting with Daryn over more shop things. Carrying that over we’re trucking on the shop front. Space is in final lease, patio possibilities looming, bank re-engaging, getting quotes on everything from signage to cheese, networking, you name it we’re getting involved with it. Life is crazy and I’m glad to be along for the ride.